1963: Innovations in the kitchen, while even more helpful, begin to grow more complex. 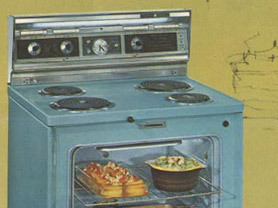 The P-7 self-cleaning oven is introduced. In developing the oven, which uses a pyrolytic system to remove food soil, GE engineers are granted some 100 patents. While it took about another two decades for a self-cleaning oven to enter any of the houses in which we have lived, what a great invention GE brought to life. Last night I pressed a button, and this morning I woke up to find all traces of Thanksgiving had vanished from my oven. This entry was posted in Uncategorized and tagged dorcas reilly, GE, green bean casserole, kitchen inventions, self-cleaning oven, thanksgiving. Thanks! Our high school class of ’63 is planning our 50th reunion next year on Facebook. Forgot about the turquoise appliances, I’ll have to post this for them. No telling how many pictures we will come up with! It’s now on our collective hips. My self-cleaning oven means this: It does a half-assed job and then I have to do the rest. It should be fired, but it has tenure.